Now, you don't need to memorize those long conjugation tables anymore. With this Verb Conjugator app for Nokia smartphones, you can conjugate verbs in 5 different languages: Spanish, English, Italian, French and German. ... all while you're on the go. Ideal for language learners at school, work, home or traveling. Internet connection is NOT required. 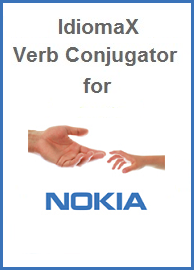 IdiomaX Verb Conjugator for Nokia converts your Nokia Smartphone into a Verb Conjugation device that goes everywhere you do. Conjugate verbs in five different languages without missing a beat in your busy schedule. It takes years to master just one language. The biggest challenge for most language learners is verb conjugation. Our Nokia offline Verb Conjugator app does the work for you in record time, providing conjugation in an instant. You get English, French, Spanish, Italian and German... all in the palm of your hand. If you spend a lot of time on the move, the Nokia Verb Conjugator is going to become your faithful sidekick. It converts your Nokia Smartphone running the Symbian S60 or Symbian^3 operating system into a verb conjugation device. Conjugate Verbs in English, Spanish, French, Italian and German. Learn a new language while commuting or during down time. Devices with 64 MB RAM and at least 5 MB free. *Nokia is a registered TradeMark of Nokia Corporation.